With Australian Blue Mountain Blend, helps turn your long hair into a soft, luscious, swingy curtain of gorgeousness. You'd be forgiven for thinking Blue Mountain Blend was some kind of coffee. Fear not. It's a concoction of two very different kinds of Eucalyptus extract, and definitely wouldn't taste good with milk and two sugars. 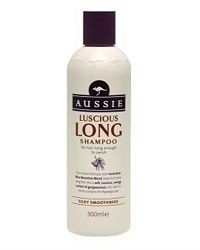 I love Aussie products and usually use the Mega shampoo. I spotted the Luscious Long one on the shelf and as I have long hair thought I'd give it a try. It smells lovely and when applied to hair lathers up really well. On rinsing sounds squeaky clean. The problem was on drying. When I dried it my hair just looked over processed. Very heavy and dragged down. I think the product was just to rich for my hair as it looked like it needed another wash. Doesn't do anything to my hair except wash it. From the description on the bottle I was sold but unfortunately for me it doesn't turn my hair into a "soft, luscious, swingy curtain of gorgeousness". I would say this shampoo is probably best for fine hair as it can dry out thick hair like mine . Expensive, leaves hair dry, need a conditioner with it. Did not notice much difference to my hair after using the shampoo on it's own, apart from it looked and felt dry. Need a good conditioner with this product. Too pricey for what it does.